For some children spending Easter at home with their families will not be possible. This Easter there will be many children spending time in hospital. The RNLI Lifeboat Station in Clacton are collecting Easter eggs and plan to make a special delivery to some of these children on Saturday 18th March. The eggs will be donated to Addenbrooke’s Children’s Cancer Ward, Colchester Hospital Children’s Ward and Children’s Hospices throughout the region, and will hopefully bring a smile to the faces of those seriously ill children who will be spending their Easter in hospital. Thompson Smith and Puxon became aware of the initiative through Louis Scott of Omega Property Services, our neighbours on Station Road in Clacton. As well as working for Omega, Louis also volunteers at the Clacton Lifeboat Station, and sent out an appeal to local businesses for their support for the campaign. 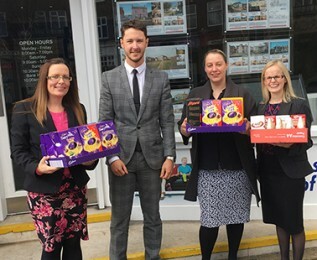 The ladies from the TSP Residential Property team in Clacton were keen to support this initiative and are pictured delivering their Easter Eggs to Louis at his office. From left to right are Catie Spink, Louis Scott, Marie Crawley and Carly Callaghan.